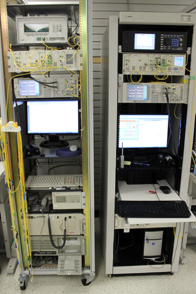 You can expect superior fiber optic calibration services built on proven calibration procedures in accordance to our thoroughly maintained Quality System. We see our services as being ''better than calibration'. In 2002, upon the creation of AssetRelay and in order to ensure that the products sold were of the highest quality, a full time technician was hired to start testing, calibrating and repairing products in our inventory prior to shipping them out. Today, AssetRelay is the largest used optical test and measurement equipment reseller in North America. That growth was fueled mostly by the customers' recognition of the quality of the products shipped out to them. The lab has been the key to this success. The expertise built on AssetRelay products is now offered as a "product" sold to the reseller or the end user community. You can expect superior fiber optic calibration services built on proven calibration procedures in accordance to our thoroughly maintained Quality System. Being an independent lab, most procedures were developed ' inhouse' with the goal of ensuring that each instrument is calibrated in accordance to generally available manufacturer's specifications and PhotonCom's own test procedures. In many instances, our procedures surpass the manufacturer's fiber optic calibration procedures. For example many wavelength meter manufacturers will issue calibration certificates based on a single wavelength verification. Our procedures guarantee that we test several values within the specifications. We measure and calibrate at several wavelengths, we ensure that power specifications are also met and we also measure several other specifications such as linearity, stability, ripple, etc.,. We see our services as being ''better than calibration'. This means that not only is the product confirmed to meet specifications; it is also, when possible and not too much time consuming, realigned to bring it back to the center of the specifications.